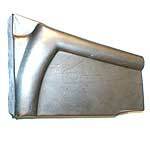 These are the complete front cowl side panels for the 1928-29 Model A.
Cowl Patches for the 1930-31 Model A Ford. They are a dye stamped patch for the cowl that is 5" high. Only available in pairs. Made in USA. Cowl Patches 1928-29. They are a dye stamped patch for the cowl that is 6" high. Only available in pairs. Made in USA. New Contoured Cowl Patch Set for the 1930-31. High quality die stamped panels. Correct beading and full compound curves to match original contour. This new die has a sharper bead at the bottom of the panel than the 5" tall version (A-014-B) This panel is 8 inches tall. Complete Cowl Panels 1930-31. This is the complete cowl panel. The 28-9's fit all body styles except the 4-dr Sedans. The 30-1's fit only the open cars. Made in USA. Cowl Post, Left. 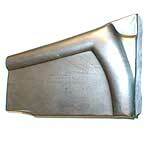 Fits the 28-9 Roadster, Roadster Pickup, and the Phaeton. Comes with the cowl post bracket. Will not fit closed cars. Made in USA. Cowl Post, Right. Fits the 28-9 Roadster, Roadster Pickup, and the Phaeton. Comes with the cowl post bracket. Will not fit closed cars. Made in USA. Cowl Post Patch 1928-29 Left. This patch comes up 6-1/2" on the bottom of the 28-9 cowl post. Made of same gauge steel as original. Made in USA. Open cars only, doesn't fit closed cars. Cowl Post Patch 1928-29 Right. This patch comes up 6-1/2" on the bottom of the 28-9 cowl post. Made of same gauge steel as original. Made in USA. Open cars only, doesn't fit closed cars.